Kissinger’s judgment was horrifically wrong. The results of Indonesia’s invasion were extremely significant: more than 100,000 dead and decades of repression that would end only in 1999, with an intervention by the international community. Yet, despite this history, when we talk about the humanitarian calamities of recent decades, East Timor tends to be overlooked. Cambodia, Rwanda, the Balkans, and Darfur loom over contemporary discussions of genocide, but not East Timor. Robinson’s book is thus a valuable addition to the literature on genocide and intervention. A professor of history at UCLA who worked for the United Nations in East Timor during the violence of 1999, Robinson has fused his own observations from that harrowing time with a more general history of East Timor to produce a thoughtful and intelligent volume. East Timor’s problems can be traced to the fact that it was colonized by Portugal, whereas its larger neighbor, Indonesia, was colonized by Holland. As a result, even though the two territories were geographically linked—East Timor consists of the eastern half of an island whose western half is part of the Indonesian archipelago—they developed separate identities. Indonesia won its independence from Holland in the 1940s, but the Portuguese held on to East Timor until 1975. Indonesia was then ruled by Suharto, a brutal dictator who had taken power in a coup in 1965—and whose staunch anti-communism made him a valuable American ally. As Portuguese rule in East Timor deteriorated in the 1970s, three factions emerged to vie for control. One party, Fretilin, favored instant decolonization; among its founders was José Ramos-Horta, who would go on to win the Nobel Peace Prize. A second party, the UDT, advocated a slower shift toward independence. The third party, Apodeti, argued for integration with Indonesia. Local elections held in 1975, albeit under imperfect conditions, suggested that Fretilin commanded a “substantial majority,” according to Robinson. It seemed that the people of East Timor did not want to become part of Indonesia. But Indonesia was not interested in what the East Timorese wanted. The Indonesians believed that Fretilin was a communist organization—something that Robinson says was “demonstrably false”—and may also have coveted East Timor’s offshore oil. A Fretilin-UDT coalition did not last, and Indonesia took sides in the violence that erupted among the different factions, supporting the UDT and Apodeti. Fretilin eventually emerged from this fighting in control of East Timor, and formally declared the country independent from Portugal on November 28. Nine days later, Suharto—having received tacit consent from Ford and Kissinger—invaded. Fretilin was deposed, and East Timor became part of Indonesia. Eventually the famine subsided, but Suharto continued to rule East Timor with a heavy hand. In 1991, Carlos Belo, a Catholic bishop who would share the Nobel Peace Prize with Ramos-Horta, said East Timor was a place in which “half of the population is paid to spy on the other half.” Yet the East Timorese never gave up on the concept of independence. In 1998, after Suharto stepped down and his successor, B.J. Habibie, signaled some flexibility, the East Timorese pressed their advantage. The following year, with Indonesia weakened by a financial crisis and desperate for international assistance, Habibie agreed to allow East Timor to vote on independence. United Nations officials including Robinson (on leave from UCLA) soon arrived in the region to facilitate the election. The problem was that the Indonesian government had not resigned itself to the likelihood that East Timor would become independent. On the contrary, it intended to win the referendum through any means possible. As the summer of 1999 unfolded, it became clear that Jakarta was backing East Timorese militias that opposed independence. The atmosphere in East Timor grew violent, to the point where the United Nations considered delaying the vote. The situation was not made any better by the fact that the U.N. monitors were unarmed, and therefore powerless to do anything but observe. 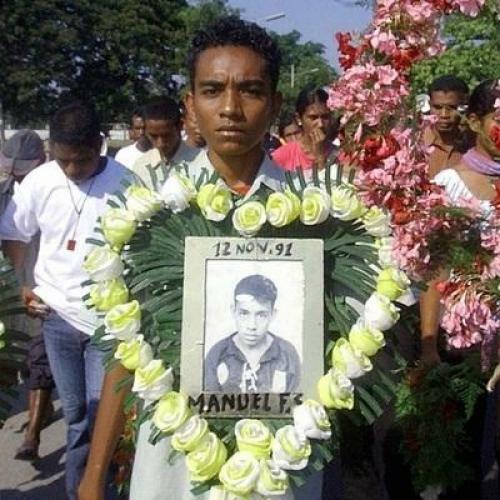 East Timor appeared to be on the brink of another genocide. What saved it was a rare instance of the international community—fresh off the successful intervention in Kosovo—acting swiftly. After some initial missteps, President Clinton began talking tough with Indonesia; meanwhile Kofi Annan emerged as a strong supporter of intervention. By mid-September, a United Nations contingent with Chapter VII authority—that is, the authority to use force—was on the ground in East Timor. Order was shortly restored; and, three years later, East Timor officially declared its independence from Indonesia. Reading Robinson’s account, I was struck by two things. The first was how poorly a diverse array of American officials conducted themselves when it came to East Timor. No one will be surprised to hear that a realist such as Kissinger endorsed the Indonesians’ decision to invade. But it was not just Ford and Kissinger who abetted the disaster. From 1975 to 1979, the four years during which Indonesia carried out its genocide, Washington provided more than $318 million in weapons to Jakarta. That amount peaked in 1978—under Jimmy Carter, a supposed champion of human rights. So the ability to ignore human rights, to regard mass killing coldly and cynically, is not the province of any one political party or even any one ideology. The left likes to accuse the right of ignoring human rights; and neocons, in turn, like to charge the dovish left with being allergic to humanitarian intervention. But in the case of East Timor, right, left, realist, idealist, dove, hawk—all of them managed to acquit themselves badly. The second striking thing about Robinson’s book has to do with a contemporary situation a world away from East Timor. It is impossible to ignore parallels to the upcoming referendum on independence in southern Sudan. Of course, no two geopolitical situations are identical, but the parallels here are substantial. Like East Timor, South Sudan has long viewed itself as a separate entity. And the strategy employed by Indonesia to counter Fretilin—genocidal counterinsurgency—was more or less the same strategy used in the 1980s and 1990s by Sudan to fight the southern rebels. Khartoum has now agreed to let the south vote on independence—just as Indonesia did for East Timor. If the south opts for independence at the ballot box, it is widely feared that Khartoum will instigate violence. And, again like Indonesia in 1999, it will probably rely on militia proxies to foment this violence, so that it can maintain deniability on the international stage. The experience of East Timor would seem to offer a simple lesson for the challenge that we may be about to confront in Sudan: when violence breaks out, the quick dispatch of peacekeepers can save huge numbers of lives, and prevent full-blown genocide from erupting. Except that the parallel is not so simple. The United Nations intervened in East Timor only after Indonesia quickly gave its assent. Had Jakarta failed to give permission, there is little reason to think the United Nations would have barreled into East Timor anyway. Why did a country orchestrating mass killing so quickly agree to have an international force intervene and put a stop to it? The likely reason is that, thanks to the financial crisis of the late 1990s, Indonesia was in a uniquely vulnerable position. Just days before Habibie agreed to accept U.N. troops, the IMF and the World Bank put Indonesia on notice that its actions in East Timor were jeopardizing its relationship with those organizations. It is little wonder that Habibie caved so quickly. Serious leverage, in other words, was the key to stopping genocide in East Timor. But serious leverage is hard to come by—and we do not have it with Sudan. If there is violence in the south, we should not expect to see Bashir welcome a U.N. peacekeeping force to protect civilians. And we should not expect to see the United Nations authorize a peacekeeping force without getting Bashir’s consent. As a result, we will have to create leverage with Khartoum that we do not currently have. We will have to be willing to put real military threats on the table, as we did in Bosnia and Kosovo. Bashir must be made to realize that another killing spree will entail devastating consequences for his regime. Wouldn’t it be wonderful if, ten years from now, there was a book that carried the subtitle, How Genocide Was Stopped in Sudan? Richard Just is the executive editor of The New Republic.